The Salon International de la Haute Horlogerie (SIHH) Genève is the most prestigious luxury watch fair in the world. A total of 35 maisons and 17 independent watchmakers exhibited at the 29th edition of the SIHH. Gulf Business was on the ground at the annual event to pick out a few of our favourite finds. Trust Maximilian Büsser to find the inspiration for his work in the strangest of places. That for the Medusa came from a rather unfortunate incident – his wife getting stung by a jellyfish while the duo were on a holiday. The jellyfish served as the shape of the Aquapod wristwatch from a few years ago, and now again for this Medusa table clock that can also be suspended from the ceiling. There is an 18,000vph movement inside with a seven-day power reserve surrounded by hand-blown Murano glass dome in the shape of a jellyfish. MB&F reportedly approached over 40 manufacturers to produce this unique glass shape, only four of which said that they were capable of developing it, and only one with which MB&F finally partnered to manufacture the glass. It comes in variants of blue, green and pink each limited to 50 pieces. This true high-complication timepiece was the smartest mechanical watch at the SIHH. Whereas most mechanical watches return a three-day power reserve, a bold few up to a week, this Twin Beat that runs a power-hungry perpetual calendar function returns a jaw-slacking 65-days of power reserve. How, you ask? It has two oscillators, one which runs at high beat frequency of 5Hz which is perfect for when you have it strapped onto your wrist (a higher frequency is necessary to withstand the rigours of physical movement and still keep accurate time), and the second can be manually set to run at a low beat frequency of 1.2Hz – think of it as similar to putting your phone into power-saving mode – when you take the timepiece off and place it at your bedside. Genius. It’s a big year for Lange. The bastion of German fine watchmaking is celebrating the 25th anniversary of its rebirth. In its second lease of life, Lange has grown into, arguably, one of the finest luxury mechanical watchmakers this side of the Swiss border. Its watchmaking prowess comes out in full force when you flip this watch over to get a glimpse of the Calibre L952.2 movement with 729 components and a one-minute tourbillon. 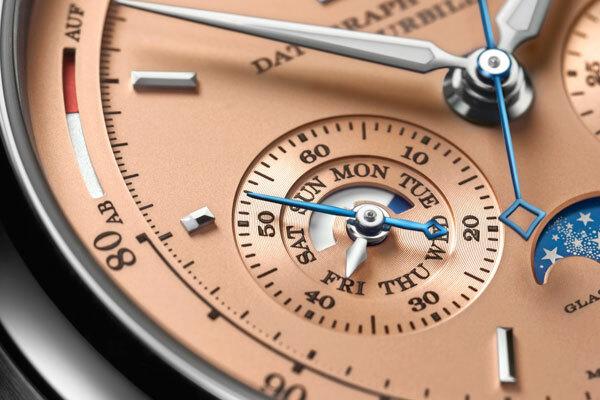 Flip it back to the dial side and you’ll see the hours, minutes, seconds, perpetual calendar, large date, moon phase, flyback chrono with a tachymeter scale and a power reserve indicator all arranged brilliantly on that striking pink gold dial. Just make sure you don’t refer to it as a ‘salmon dial’. AP wasn’t ready to play to the gallery (it never has) by rocking up to the SIHH with only a few new Royal Oaks or Offshores. Instead, it surprised everyone by introducing an all-new Code 11.59 by Audemars Piguet collection. While the 13-reference collection which incorporates three new calibres has been a polarising one with social media pundits delivering verdicts that ranged from hero worship to outright eulogies, there’s no ambiguity when it comes to unabashedly declaring that this specific limited-edition Perpetual Calendar with a red gold case and blue aventurine starry dial was hands-down the most handsome dress watch at the fair. The spherically domed crystal, three-piece case construction with an octagonal shape in between and lugs that aren’t attached to the case make for a visually stunning timepiece. Then again, you wouldn’t expect anything less from AP, would you? The refreshed Cartier Santos collection was launched last year, and one of this year’s iterations is this new blacked-out ADLC coated timepiece. This watch has no dial and hence the baseplate of the movement has been skeletonized to reveal the Roman numerals. It is, in effect, the bridges of the movement which are coated with Super-LumiNova that is invisible during the day, but shines brightly in the dark. Thanks to the skeletonised movement, you’ll be able to take a good look at the most of the 138 components in the manual-winding 9612MC manufacture movement that includes two barrels to deliver 72 hours of power reserve. A riveting sight. Yes, those are miniature creations of lollipops, slices of candied citrus fruit, square pieces of liquorice and even a marshmallow on the dial. And yes, you’re looking at a Richard Mille. The Bonbon collection consists of 10 watches, each limited to 30 pieces, and is the artistic brainchild of Cécile Guenat, daughter of Dominique Guenat who is Mr Richard Mille’s business partner. Don’t let those bright colours and playful theme eclipse the serious hardware that has gone into this timepiece. Fraise, strawberry in French, is a name derived from the fact that it has red quartz TPT on the sides of the case and the caseback, while the front of the case is made from Carbon TPT, courtesy the Swiss-based North Thin Ply Technology. Inside, there’s a 16-01 skeletonized automatic movement with a baseplate and bridges made from grade 5 titanium. Definitely a thoroughbred Richard Mille. The Luna Rossa is going to challenge the defending champions at the 36th edition of America’s Cup slated for 2021. To that end, Panerai signed a deal with Patrizio Bertelli, President of Luna Rossa and CEO of the Prada Group – title sponsors of the Luna Rossa alongside Pirelli – and this timepiece is the result of that partnership. In a reference to the carbon fibre hull of the Luna Rossa, this 47mm dive watch with a three-day power reserve and GMT function is made from Carbotech, a proprietary material also made from carbon fibre. Interestingly, the dial of this automatic winding timepiece with 72-hour power reserve is made from a piece of the actual sailcloth from the Lunar Rossa which is a mix of carbon and kevlar. This timepiece is critic-proof, and might well be bulletproof too. The 160-year-old Minerva manufacture in Villeret has been making watches uninterrupted since its inception. That’s where the in-house manual-winding MB M16.31 chronograph movement within this high-end monopusher sporty timepiece, limited to 100 pieces, is manufactured. and the other being a chronograph totalizer – while at the centre of the dial is a snail-shaped tachymeter scale. Davide Cerrato has a winner on his hands. Hermès is keen to signal that it is no longer a fringe player in the luxury watchmaking field – and this Arceau L’heure de la Lune make the strongest case yet for it. There’s a pair of stationary mother-of-pearl moons (you can see a Pegasus motif on the moon at 12 o’clock if you look closely enough) and a pair of floating lacquer discs that rotate around the dial every 59 days. While the main dial is made from a meteorite, there’s another aventurine version too. Below the dial, you’ll find an Hermès calibre H1837 fitted with a patent-pending ‘L’Heure De La Lune’ module that consists of a 100 components and was specifically developed for the rotating discs on this timepiece. And that’s why La Montre Hermes earns our respect, and should yours too.